Photo: Vie De La Campagne, 15th April, 1935. Courtesy of The CFA Foundation, Inc. In the history of the Birman as a breed, 'Dieu d'Arakan' stands as the probably the most significant pre-war Birman cat of recognisable quality, especially when you consider that his foundation forebears arrived in France a mere ten years before his birth, and the breed, by necessity, had been subjected to outcrossing to Siamese and possibly other breeds in order to ensure its survival. 'Dieu d'Arakan's' overall type was so demonstrably ahead of his time that he became, almost by default, the hallmark standard-bearer for the future of the breed. His appearance simply raised the bar for 'type' to new levels, and once seen, every Birman breeder of note wished to emulate his looks within their own breeding programs. He had the shape, the coat, the markings and the eye colour. In short, they didn't come any better than this. Here was a Birman cat that could proudly stand beside all-comers in other breeds and be recognised as distinctly unique, with an air of quality that was unparalleled within the breed up until that point in time. 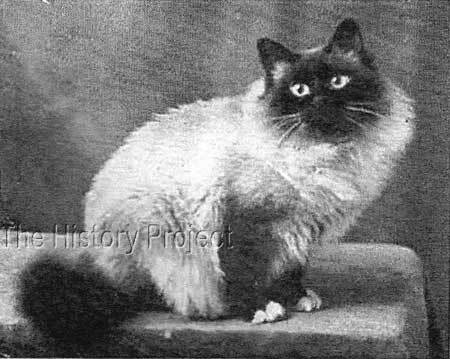 The image below is of an admirable seal point Birman, who must date from around 1927 or 1928 as the photograph was selected by Dr. Phillipe Jumaud for publication in the 1930 edition of his thesis, Les Races De Chat3. Although as yet, the author has not found any other contemporary reference to Madame Brassart, it is clear that her cats were of recognised quality to be chosen to represent the breed in Dr. Jumaud's book. This cat, appears to be in the limelight at much the same time as Marcel Baudoin's new male, 'Lon Saito of Madalpour'. It should be noted that there are no firm records for the parentage of 'Dieu d'Arakan'. But given that Monsieur Baudoin-Crevoisier owned 'Lon Saito of Madalpour' and 'Ijadi Tsun' at the time, one cannot but wonder if these two were not involved in the production of such a fine specimen. The astonishing 'Dieu d'Arakan' bred by Marcel Baudoin. 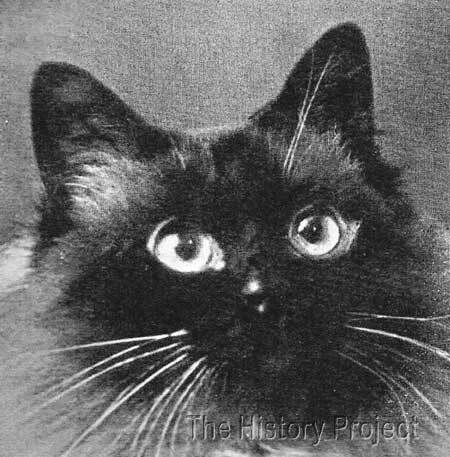 "Baudoin also specified that the Siamese and the Birman cats share their origins and he added 'a crossed Birman and a gloved Siamese produced, in the second generation, a stong proportion of Birman characteristics. 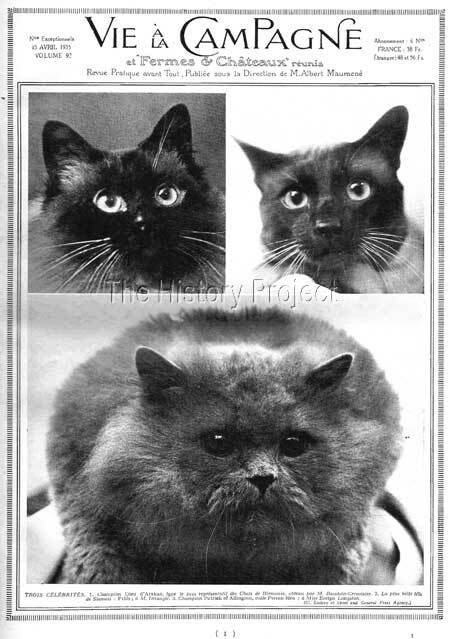 And these cats, from new crosses between themselves, produced kittens with at least 80-90% Birman characteristics.' Perhaps he was lucky." 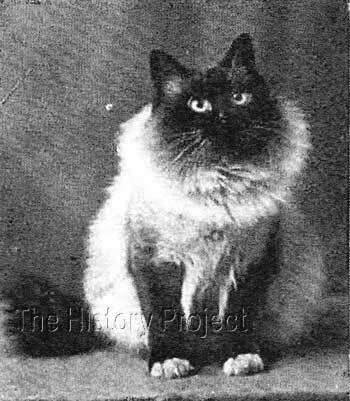 Despite his considerable successes on the show bench before and during 1932, and whilst French cat breeding continued to improve, gained status, Baudoin appears to have become discouraged. Barnay tells us that in June, 1932, he wrote that his financial affairs were difficult and that cat food was expensive etc. Barnay informs us that two other Champions bred by Baudoin were sold in Belgium, to Mlle Rouselle, the general scretary of the Cat Club of Liege. These were 'Lon Saito de Madalpour' born in 1927, and 'Zaquelle de Mandalay' born in 19311. Although it is likely that Monsieur Baudoin would have bred full and/or half siblings to 'Dieu d'Arakan', there are no records which can be tapped to confirm this. We do know that he bred from related lines, but to affirm that any of these were in fact siblings could only be based on conjecture. 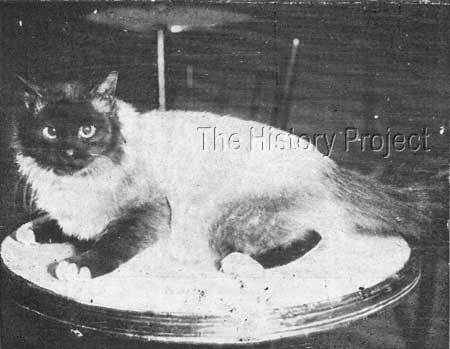 'Dieu d'Arakan' appears to have first been shown in a class of young males on 11th and 12th April, 1931 at the Second International Cat Show in Reims, where he carried off his first prize.1 This show was run by Cat Club of Champagne. Among Baudoin's winners were the males 'Soleil d'Arakan', 'Bouli d'Arakan', 'Roult d'Arakan, 'Prince de Rangoon' and 'Dieu d'Arakan'. In the females were 'Rose de Magock', 'Poupee de Rangoon', her daughter 'Reine de Rangoon' and 'Zaquelle de Mandalay'. 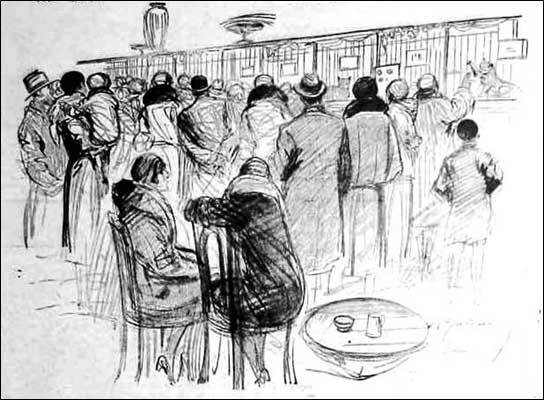 Spectators observing the cats at the Show run by the Cat Club de Paris, at the Salle Wagram, in December 1930. This was the year in which 'Dieu d'Arakan' was born. 'Dieu d'Arakan' is likely to have sired successfully for Marcel Baudoin-Crevoisier, but again, there is no extant documentary evidence of his progeny. The best and only references for progeny from 'Dieu d'Arakan' are those gleaned from details of his later years when he very fortunately came under the careful stewardship of the Countess Elisabetta Giriodi-Panissero. In the book by Marcel Reney, Nos Amis Les Chats (Our Cat Friends), published in 1947, Chamonin claims to have visited the Francecavilla-Bisio castle, near Novi-Ligure, in 1936. There he apparently saw 'Dieu d'Arakan' and 'Reine de Rangoon', surrounded by seventeen cats and their fourteen kittens!1 Poirier then sadly advises: "Since then, no one has heard any more about them." 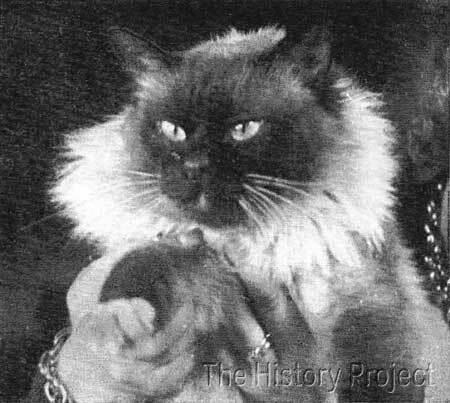 Even sadder, is that Marcel Chamonin's own cats were also eventually lost. These included those he had bought from Baudoin and 'Sinh de Saint-Hubert' whom he had purchased from Mlle Rouselle in Belgium. Those that remained were tragically lost in a fire at his home. So unless some of the kittens held by the Countess were used for breeding and or passed into new ownership, it seems likely that there are no verifiable offspring of record for the magnifcent 'Dieu d'Arakan'. International Champion Dieu d'Arakan, bred and owned by Marcel Baudoin-Crevoisier. Close-up head-shot of International Champion Dieu d'Arakan, bred and owned by Marcel Baudoin-Crevoisier. An impressive full body view of International Champion Dieu d'Arakan, bred and owned by Marcel Baudoin-Crevoisier. Cover page of the 15th April 1935 edition of 'Vie A La Campagne', featuring a close-up head shot of International Champion Dieu d'Arakan, bred and owned by Marcel Baudoin-Crevoisier. Perhaps Monsieur Baudoin was right for the times. In his view, it was important to set the conformation, and to be seen striving to breed consistently good seal points before attempting to branch off on a new colour tangent. And he had proven to all-comers that he knew what he was talking about. His 'Dieu d'Arakan' was the new standard, and in him, the cat world got a surprising glimpse of what could be achieved. He was simply a cat that once seen, could never be forgotten. Vie A La Campagne, 15th April, 1935. Les Races De Chats, by Dr. V. Phillipe Jumaud, 1930. Photos and quotations as per credits and/or sources listed.